Desk.com is Salesforce.com's cloud-based customer service offering for very small to medium-sized businesses. Its strengths include case management and reporting capabilities, as well as channel and mobile device support. Case management capabilities are broad and deep. Reporting capabilities include dashboards and a large set of predefined reports, including reports on knowledge usage and performance. Desk.com’s knowledge model and knowledge management services support multiple languages very well. Its closest ompetitors are Freshdesk, Microsoft Dynamics CRM Service, and Zendesk. All of these offerings are built on a case management core with knowledge management, community, social customer service, chat, and contact center as included and/or add-on features. All of them deploy in the cloud and support mobile devices. All offer tiered packaging and pricing. Salesforce Desk.com’s pricing is at the high end, but Desk.com has the deepest capabilities, especially in knowledge management and reporting. 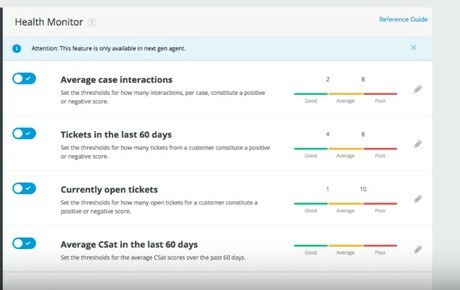 Desk.com is Salesforce.com’s customer service offering for very small, small, and mid-sized businesses as well as for small departments in larger organizations. The product is based on technology that came to Salesforce.com In its acquisition of Assistly in September of 2011. To date, we estimate that approximately 20,000 customer accounts have licensed Desk.com. Desk.com provides case management, knowledge management, and communities/forums capabilities across assisted-service, self-service, and social customer service channels. Customers purchase subscription licenses for Desk.com for cloud-computing deployment using Amazon Web Services. The product’s self-service apps—knowledge management and search as well as communities/forums—support 50 languages. One of its most interesting characteristics is its Customer Health Monitoring. Customer Health puts the feedback of Customer Satisfaction scores into the context of recent case management activity, including the average number of case interactions, the number of cases in the last 60 days, the number of currently open cases, and the average CSat score in the last 60 days. On the other hand, Customer Health does not include customer self-service activities. Desk.com earns a good report card. The product earns Exceeds Requirements grades in Knowledge Management, Customer Service Integration, and Company Viability. It earns Meets Requirements grades in Search and Product Viability. And, it earns a Needs Improvement grade in Reporting because it does not instrument or report on self-service activities. Blake Cocoa	on October 18, 2016 at 4:41 a.m.
Lowri Parry	on October 18, 2016 at 9:08 a.m.
David Carter	on January 4, 2019 at 9:39 a.m.